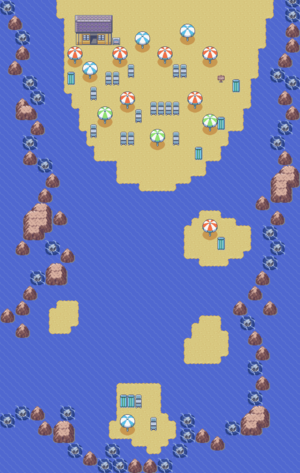 As soon as you arrive you will be in Slateport's beach and will encounter more than a couple trainers on your way up to the city. Talk to the little girl with the pink inner tube and she will give you a Soft Sand just for talking to her. The trainers aren't a big deal but will offer some experience points which will be useful in your next encounter with Aqua/Magma. At the north west part of the beach is Seashore House. The owner of this house loves watching heated battles, and if you can defeat all the trainers in the house, you get 6 Soda Pops! Ether - hidden on the south-east corner, directly south-east of the two children, and east of the beach towel. Come back with Surf for a few more goodies and experience. This page was last edited on 27 November 2018, at 06:25. This page has been accessed 32,526 times.